QCMA is an open source Content Manager Assitant for the PS Vita. Since Sony forgot about Linux users i decided to make an implementation of their CMA using the vitamtp library that Yifan Lu made. QCMA is made in Qt so it can be recompiled to Windows and Mac OS X (or even Android?) without trouble. Right now there is only a release for Linux since the vitamtp library sources aren't fully ported to Windows. Mac binaries are coming soon since i don't have a working toolchain for that platform right now. The database is created in memory so is lost when QCMA exits. This will be solved once the SQLite backend is complete. Multimedia changes on the PC requires a database refresh. This will be solved when the file monitoring daemon is completed. Photo streaming restricted to jpg. I will add support for the rest of the formats on the next days. Music streaming via WiFi has glitches (for example doesn't listen the categories on the first try). This happens with the official CMA too. The aim of this project is to provide a implementation that is on par with the official CMA and also offer some features missing in the original one. Basic metadata for single songs (album, artist, title, cover art). Basic metadata for videos (duration, dimensions, thumbnail). Basic metadata for photos (dimensions, thumbnails). Simple backup browser: view and delete the backups on your PC without a Vita. Easy wireless pairing (show PIN to the user when a Vita is detected). 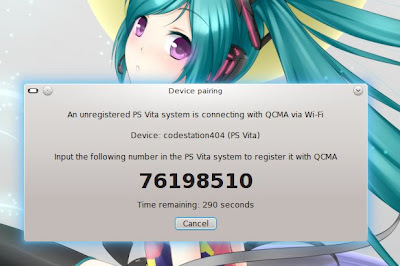 Ability to restart the connection if the Vita is reconnected. UPNP bridge: connect an existing UPNP server to interface with the Vita using the wireless streaming feature.